The circle of life could not be more evident than when one witnesses a river full of Sockeye Salmon (Oncorhynchus nerka) during their annual spawn, where adult sockeye return to their home streams from the ocean in order to deposit and fertilize their eggs, and die. Just prior to spawning, they will change from the silvery blue of a fresh run fish from the sea, to the vibrant colors you see here. Brown bears contribute to the great circle, with the ability to eat as many as 20 salmon per day. 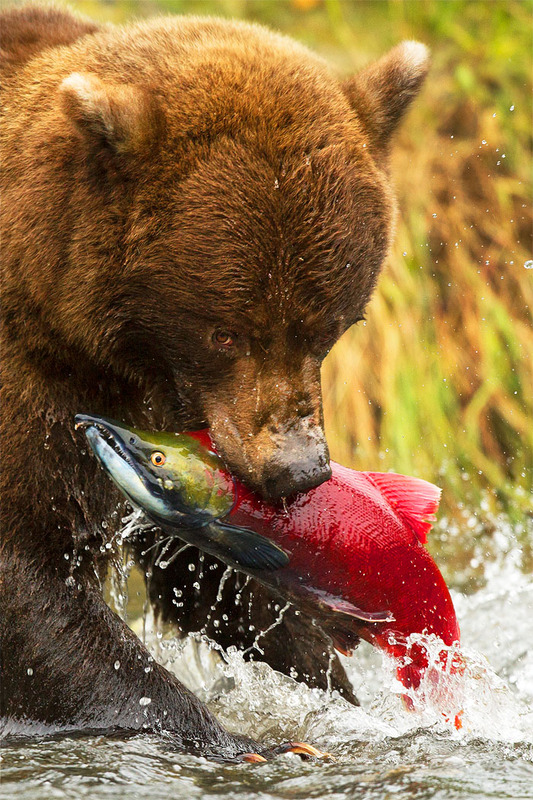 In this photograph, an Alaska coastal brown bear (Ursus arctos) emerges from the water with a bright red Sockeye salmon -- one of many catches he'll make during a time of year where his mission is to do nothing more than fatten up for the long winter hibernation ahead.